How to show hidden files in cPanel File Manager? This article will explain how to display hidden files like htaccess when using cPanel File Manager. The cPanel File Manager does not show the hidden files by default. One of the typical example of a hidden file is the .htaccess. One might need to edit the .htaccess file to modify or apply some URL redirection etc. Follow the below steps to show the hidden files in cPanel File Manager. 3. This will display the File Manager Directory Selection. 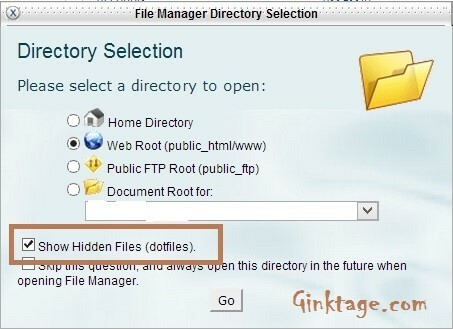 Check or enable the option “Show Hidden Files (dotfiles)”. And click Go. 4. You should now see the hidden files (htaccess) in your File Manager.